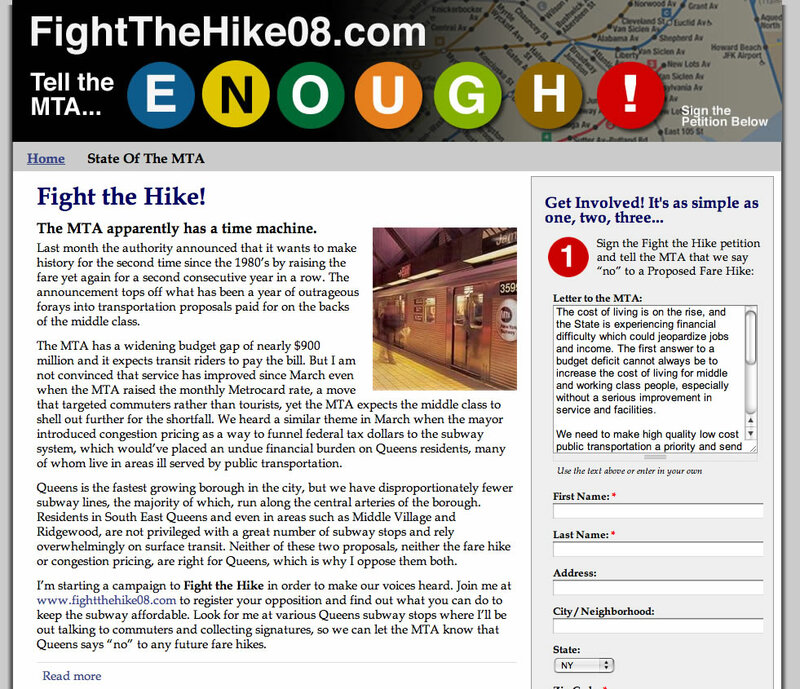 "Fight the Hike" was an initiative to keep NYC transit fares down that was a joint venture of Joe Addabbo (NYS State Senate) and John Liu (NYC Comptroller). A contemplated increase to $2.50 was scaled down to $2.25, and the campaign was likely a contributing factor in arriving at the final number. Joe Addabbo was particularly visible in support of it - by campaigning at transit stops in the district, he was able to define himself as a true defender of working people. The message clearly resonated: Joe was able to defeat a Republican incumbent, thus handing control of the NY State Senate to Democrats for the first time since 1963.
Notable about "Fight the Hike "08" was the press coverage it received; see this clip from the CBS local news. It's the first time one of our websites was featured on TV - pretty cool!